Bone Broth is a traditional food that is generally made by boiling and simmering roasted bone for a long period of time. It is a great source of protein, collagen, antioxidants, amino acids, and minerals. Dr. Lam's Adrenal Broth provides vital basic and foundational macronutrients sorely needed in advanced adrenal fatigue recovery. 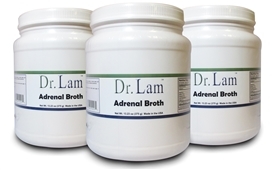 Dr. Lam's Adrenal Broth provides you with the benefits of bone broth in a convenient form. It’s easy to make. Simply stir into water, juices, protein shakes, or smoothies and drink! Not a significant source of saturated fat, trans fat, cholesterol, fiber, sugars, vitamin A, vitamin C, calcium and iron. Stir one scoop in 10 oz. to 12 oz. of water, juice, smoothie, or protein shake until completely dissolved, once per day or as directed by your healthcare practitioner. Gluten, sugars, artificial sweeteners, colors, flavors, corn, wheat, yeast, eggs, or preservatives. Store in cool dry place after opening.